Let’s jump right into this. The way this year has already flown by, I’ll be pulling down decorative pumpkins in no time. April is here and there is a lot going on around here. Spring is here for good! We’ve had our Great Sadness….tree pollen release which brought about some allergy nastiness and yellow clouds of misery. 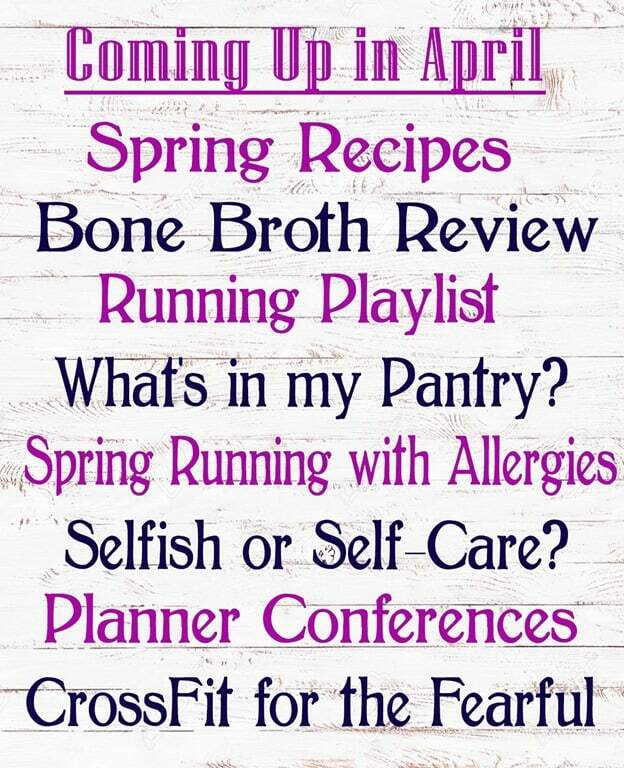 Naturally, tis the season for a post on running with allergies. Or not running due to allergies. Planner conferences? A conference about planning? Yes. Absolutely. A year later, maybe it’s time to share the 2018 Go Wild weekend. The 2019 conference is in a few short weeks! CrossFit is not for everybody. But, if the only reason given for not trying is because of fear of what everyone else is thinking, then I’ve got some thoughts on that. A thought-provoking thought post for the CrossFit Fearful. What’s in my pantry? Other than allergy medication and boxes of bone broth for a bone broth review, I keep everything else orgazined in bins. I’m linking up with a few favorite bloggers to share a look into our pantries. It’s an organization overhaul. Stay tuned and hold on. 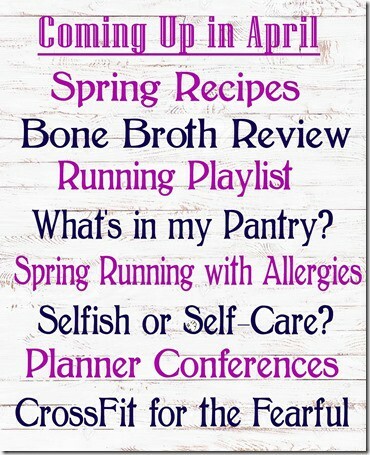 April is going to sprint to the finish line before I’ve even put on my running shoes.